The 90’s called . . .
and wanted their shower curtain back. I can’t seem to hang the new curtain, but I can’t seem to return it either. FavoriteSon says I’m right. The 90’s did call. So. He’s no help. I asked him what type of artwork he might like to hang over our bed (there’s nothing there now). After he said the words, “velvet” and “blacklight” I knew I was on my own. I’ve always known where FavoriteSon gets it. 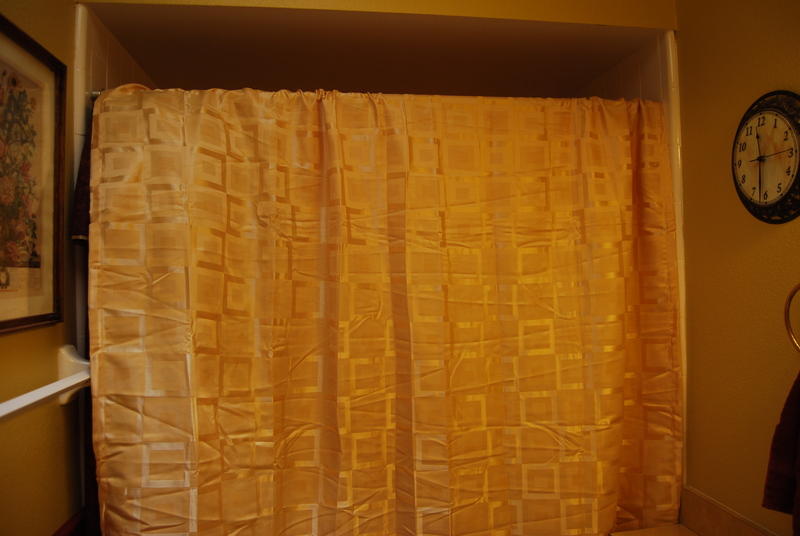 Although the photos show the EXACT opposite, the room seems brighter with the pale gold curtain. The flash didn’t go off. The room just looks darker (and smaller?) with the garnet curtain – it needed the flash. The garnet curtain never really matched the bottom wall color. The pale gold curtain is almost a perfect match for the top wall color. So why can’t I just change it already? And yes, we are Nole fans. It is a garnet and gold bathroom. At first glance, I like the red one better, but change is good and who says you have to get rid of the red altogether?! Give a try to the new one, since the change might be refreshing. Keep the red one and put it back up in the winter/fall when the dark, warmer color will add coziness and ambiance. TOTALLY love the second one…but I am NOT a big fan of the little ruffle thing going over the top of the actual curtain…but I love the second one!